Then, in the year 2000, I decided to start a small business focusing on walking & cycling tours, the best way to discover the beauties of Umbria. 18 years later, it is still this passion and love for Umbria with its spectacular landscape, kind people, delicious food & excellent wines that inspire us as a small company. In this post I would like to take you on a little journey through our beautiful region, so you can get a feel for why we love it so much. Umbria offers just the right combination of beautiful small medieval towns, leisurely walks through a stunning landscape & the ability to sample delicious local products. Many of the medieval Umbrian towns and villages have an interesting Roamn past. Assisi, Spello, Bevagna, Montefalco, Trevi and Spoleto are some of the highlights of the area. They are medieval little towns, most of them also with an interesting Roman past. Our journey starts in Assisi, the town of Saint Francis and Clare. Its pearl is the stunning Basilica of Saint Francis, but there are also many other important monuments, churches and museums to visit. From Assisi we walk through the Mount Subasio park to Spello, a quiet little town with a tangle of small streets colorfully decorated with flower pots. Spello has Roman origins (evidence are the Porta Venere and Porta Consolare town gates and the remains of a Roman amphitheater outside the town walls). Our next stop is Bevagna: unlike most Umbrian towns, it is not built on a hilltop, but in the valley, at the confluence of the rivers Topino and Timia. During Roman times Bevagna was a prosperous town, because it was situated along the busy trade road, the Via Flaminia, which connected Rome with the Adriatic coast. The ancient Umbrian town of Trevi, enclosed by medieval walls, with a center of Roman origin. Now we’ll leave these small towns and walk through a green unspoiled landscape with colorful fields, olive groves, vineyards and small waterways. From Bevagna we enter the famous wine area of the Sagrantino and Rosso di Montefalco wines. Here, tasting its wines on one of the many terraces and wine bars is a must! After the homeland of delicious wines, we arrive in the capital town of Olive Oil. 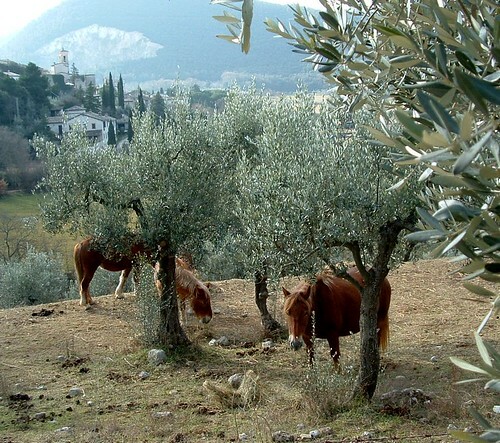 Trevi, a hilltop town, which you will see from afar, surrounded by the silver-green olive groves. The extra virgin olive oil is particularly good here: it has a beautiful green color and it is very tasty, especially on a warm toasted bruschetta. The Franciscan Way is a pilgrimage route with just a perfect combination of nature, culture, food & wine and spirituality. The last stretch of our journey is along the Franciscan Way, a pilgrimage route, which runs from La Verna in Tuscany to Rome. It passes the spiritual Franciscan places and this makes walking here just a perfect combination of nature, culture, food & wine and spirituality. Spoleto is a lovely town, very alive. There is a lot to visit, like the cathedral with frescoes of Filippo Lippi and Pinturicchio, a Roman house and a Roman theatre. Also worth seeing are the Romanesque facade of the church of S.Pietro, just outside town, and, of course, the famous aqueduct bridge Ponte delle Torri. I hope you enjoyed our little journey together, we would love to show you the real Umbria in the coming year. We offer a 5, 8 or 9 day walking holiday called Medieval Umbria where you’ll experience the very best this region has to offer. We take care of your luggage transportation, give assistance if needed… so you just walk, relax and enjoy Umbria! For more information and inspiration we invite you to visit our Medieval Umbria self-guided walking tour. We did your walking tour from Assisi to Spoleto in September – my wife and I met you Sunday evening, September 16th. I wanted to let you know what a great time we had, and especially to let you know how great your information packet was. Your directions were detailed and excellent, and we were always confident about where we were going. And if we ever got turned around, we just backtracked a little bit and read the directions more carefully, and found our mistake. And it was nice to have options on a couple of the days. We also used your notes about Assisi to guide us with our walking tour, and that helped us get to the castle, which we really enjoyed. And we used your restaurant list as a guide – we had a great lunch in Spello, even though the lady spoke only Italian to us. The hotels were excellent – we especially liked the charming Spello hotel with the view of the countryside, and the Trevi hotel was fantastic. Just a note to say thank you for your help and support. We had a great time in Umbria, and the walking was super. I will have a look at your other destinations for future years. Petra has worked for a long time for a Dutch tour-operator, before starting her own company. She loves designing and planning walking tours in Umbria and personally checks all the itineraries. Ecologico Tours specialises in walking holidays for individuals, families and small groups. All walking holidays are a lovely way to explore new fascinating destinations and historic, architectural and natural beauties. This entry was posted in Italy walking holidays and tagged culture, holiday, Italy, nature, umbria, walking. Bookmark the permalink.